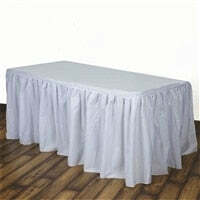 Table skirting made of linen-like, soft, non-woven 100% polyester that provides durability and easy maintenance. Polyester Table Skirt, which is White in Color and has a self-adhesive backing that makes it easy to set up around a dining table. These edged table skirt used to give a decorative look on special occasions. It's important to keep a good selection of basic decorative elements stocked in common color choices such as white, black, pink and blue that serve as the foundations for creating the right effect at every activity. With the BB Crafts Table Skirt, you can appropriately hide your table legs and make your dining table or desk look more elegant with these tablecloths. It will suit any occasion, be it a wedding, festival or a corporate gathering. Table skirts are the perfect table linens for highlighting important event tables like sweetheart, buffet, and trade show display tables. We mention covering tabletops with fixed tablecloths and attaching skirting to tables with table skirt clips. Banquet table skirt is a less expensive substitute to other table skirts that will look beautiful and professional. Though, you cannot use these tablecloths on a daily basis.